We welcome back Brian for his third visit. 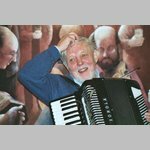 He has a vast repertoire of songs collected from people he meets when he performs in the villages of his beloved Lincolnshire. Even if we know the song he will bring something new to it and he is also an accomplished musician. So come along and be enthralled both by the songs and the stories behind them.